Birthplace : Greenville, South Carolina,U.S. Edwin McCain is an American singer-songwriter and musician.Edwin McCain, following a failed attempt at college life and a struggle for recognition on the club circuit in his native South Carolina, attained national prominence in the mid-1990s. Although sponsorship from friends and fellow musicians Hootie and the Blowfish--a popular rock act also hailing from South Carolina--helped McCain secure a record deal with Lava/Atlantic, most observers agree that the soulful performer earned his major-label contract on his own merit. Arguably one of the hardest-working figures in popular music, McCain tours constantly, performing well over 300 shows per year. Prior to his signing, he booked his own tours, managed his career, and maintained a staff on payroll. Even after his breakthrough, a self-reliant McCain continued to co-manage himself in a partnership with the Atlanta-based firm Harrington Management. Besides dedication to a strong work ethic, McCain also surrounds himself with great talent. Indeed, McCain, while at one time an acoustic solo performer, is no longer a one-man act, and he eagerly shares the spotlight with his band. Saxophonist and keyboardist Craig Shields holds a degree in saxophone performance from the University of West Virginia and also graduated from the Navy School of Music. Drummer Todd "T.J." Hall, who was replaced by Dave Harrison in 1996, came from a family of percussionists and received his Musicians Union card at the tender age of 15. Hall also attended the University of West Virginia, earning a degree in music education. At the time he joined McCain's group, he was earning a living as a high school drum teacher; he had studied African percussion and had played in various other bands. McCain's band also features bassist Scott Bannevich, who began playing professionally at age 14, and electric guitarist Larry Chancey, who joined the group in early 1997. McCain, known for his personal and honest lyrics, writes most of his roots-based material on acoustic guitar, but the influences of his band contribute elements of funk, jazz, and blues to the overall sound. "Craig and Todd bring that to it," said McCain to Buddy Seigal of the Los Angeles Times. "They played jazz at a place called the Greenbrier, a resort where they had this pretty serious jazz scene going. I'm not [a trained musician] at all, I don't even know what I'm doing. Sometimes, I have to ask the bass player what chord I'm playing." Raised in Greenville, South Carolina, McCain, who was born in Charleston and adopted, cites his early musical influences as the Jackson 5 and other Motown groups, as well as an eventual obsession with the funk act Earth, Wind & Fire. During his childhood, McCain also sang for his church choir. Then, at the age of 15, he decided to pick up the guitar, joining his first band at 17. His main inspiration by now was a local folk singer named David Wilcox. "Each song was so beautifully, poetically written," recalled McCain for an Atlantic Records press release, "and the soul and emotion in what he was doing were so great that he'd literally make people cry. I think he was the one who most inspired me to play music." As McCain approached his high school graduation, he met Bannevich, with whom he recorded his first professional demo tape. However, after promising his father he would not try to pursue music as a career, McCain enrolled at the University of South Carolina. But McCain's college career lasted only half a semester, as he was kicked out of school for streaking across campus. Afterwards, he ended up in Charleston playing music. Then, while vacationing with his family in Colorado, McCain met a singer named Shannon Tanner, who had made a lucrative career for himself playing in the bars and restaurants of resort towns. Thinking this a good direction for himself, McCain auditioned for Tanner's booking agency and landed a job at a beach hut on South Carolina's Hilton Head Island, where he played original songs and covers. He also started booking himself at additional venues--restaurants, bars, or anywhere with a deck by the beach. McCain was making a comfortable living with his acoustic solo act, but he felt driven to advance his career to the next level. Realizing that he needed to build a band in order to achieve this goal, McCain sold all his possessions--including his home studio and van--in order to fund the payroll. After assembling into a group, the Edwin McCain Band toured relentlessly throughout South Carolina and established a substantial grassroots following. The band also recorded an independent album entitled Solitude, containing six songs later reworked for their major-label debut. Meanwhile, the Edwin McCain Band received help from Hootie and the Blowfish, who regularly invited the group to open for them. McCain is good friends with that band's lead singer, Darius Rucker; however, he prefers to point toward a general regional camaraderie, rather than to a specific relationship, in explaining the support his group enjoyed. "We're all friends of each other," he told Boston Globe writer Steve Morse. "There are some great Southeastern bands that include Jupiter Coyote, Spider Monkey, the Dave Matthews Band, Better Than Ezra, Catfish Jenkins and From Good Homes. There's incredible music coming out of the scene primarily because of the lack of industry support in the past. The only way to survive was to bring your music to the people." Fortunately for McCain, the recording industry by the mid-1990s was taking a greater interest in the Southeast, a phenomenon first sparked by the rise of R.E.M. from Athens, Georgia, in the early 1980s. He and his band were offered a deal with Lava/Atlantic Records, and they released their major-label debut, Honor Among Thieves, in July of 1995. The album, produced by Paul Fox (known for his work with 10,000 Maniacs, Victoria Williams, and XTC), centered around McCain's acoustic guitar and his evocative story-telling. Such songs included the radio hit "Solitude," the album's first single; "Sorry to a Friend," about growing older; "3 A.M.," describing his early days as a solo performer; and "Alive," the tale of a record store owner who relied upon music to cope with personal loss. After debuting and peaking at number one on the Billboard Heatseekers album chart, Honor Among Thieves proved to be a moderate commercial success, selling around 220,000 units. The band toured the country in support of the album, a tour that included an appearance on The Late Show with David Letterman and a benefit concert for the America Street Foundation, a charitable organization founded by McCain to help rebuild low-income, hurricane-damaged housing for families in South Carolina. McCain returned in June of 1997 with Misguided Roses, marking a departure from his acoustic, introspective side. Here, the songwriter's tales were driven by electric guitars, and he opted for more affirmative, happy themes. "The last album did have a lot of sad stuff," McCain noted to Billboard magazine's Carrie Borzillo. "This one is a lot more optimistic. Really, I was just writing from my perspective of, 'God, why am I so down now when I have all this to be thankful for?' That's really the basis of this album." The album does feature ballads, however, most notably the gold-certified single "I'll Be," about maintaining a friendship after a mutual romantic breakup. The song became a radio favorite and was featured on the season finale of the popular teen television show Dawson's Creek in May of 1998. McCain's more rock-driven direction surfaced again with Messenger. Released in 1999, the album was produced by Matt Serletic, who has worked with Matchbox 20, Collective Soul, and Aerosmith, and Noel Golden, known for his work with Cool For August and Chantal Kreviazuk. Both producers were able to capture the band's power without sacrificing McCain's acoustic soul. Messenger featured ballads, such as a song written by Diane Warren entitled "I Could Not Ask for More," and rock anthems like "See Off This Mountain." A mix of acoustic ballads and infectious rock numbers was the formula again for Far From Over, released in the summer of 2001. It included the single "Hears Fall," a gentle, acoustic song, as well as the high-energy "Get Out Of This Town" and the power-pop tune "Radio Star." In addition to touring, the band made several television appearances in support of the release, including spots on the Tonight Show with Jay Leno and the Rosie O'Donnell Show. "I think this album is for sure the best one I've ever made," McCain stated for his official website. "It shows a side of the band that we never had really gotten on record. This time I was like, 'Man, let's just make a fun record, something where people can just put the top down and turn it up.'" Edwin's subsequent recording, a collection of R&B cover songs entitled "Nobody's Fault But Mine", was released through Saguaro Road Records on June 24, 2008 and included a version of Soul Brothers Six song "Some Kind of Wonderful." The following year saw the release of The Best of Edwin McCain, a twenty-year career retrospective that included a cross-section of material as well as a new single, "Walk With You" (produced by Don Was. )Edwin's tenth album, Mercy Bound, was released August 30, 2011 on 429 records. Reuniting McCain with collaborator Maia Sharp (who also produced), Mercy Bound features additional artistic input from Angie Aparo, Mark Addison and Anders Osborne, as well as guitar work from Warren Haynes. 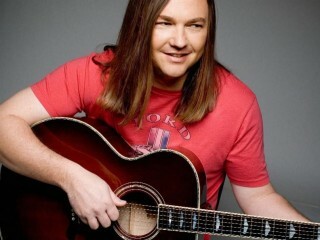 View the full website biography of Edwin McCain.